It's been in development for some time, but I can now happily say that Cognoscenti Cycles has a brand new spoke tension meter that we are excited to be bringing to market. This effort was brought to life in collaboration with Filip Kralyevski who has been gaining a reputation over the last couple of years for producing high quality spoke tension meters with important unique innovations. I first acquired one of Filip's meters while I was living in Paris. I stumbled across his amazing work while sifting through a blog that had mentioned him. I was immediately interested to find someone who wanted to push the envelope in both overall quality and some innovative ideas. After an extensive dialogue with Filip and over a year of testing his meter I knew that he was the guy to collaborate with on a special meter for Cognoscenti Cycles. The first prototype of the Cognoscenti Cycles spoke tension meter. This model has a delicately bevelled edge showing off some premium CNC workmanship. So, what is it that makes this new spoke tension meter unique? It's really the sum of it's very high quality parts. No expense was spared in the manufacturing of this tool. Filip is an expert in CNC machining and that is immediately evident when you examine the work on the 6082 alloy body. It is weight relieved with several carefully placed large cut outs that both give it a beautiful look and keep the weight down to a minimum without sacrificing any strength. 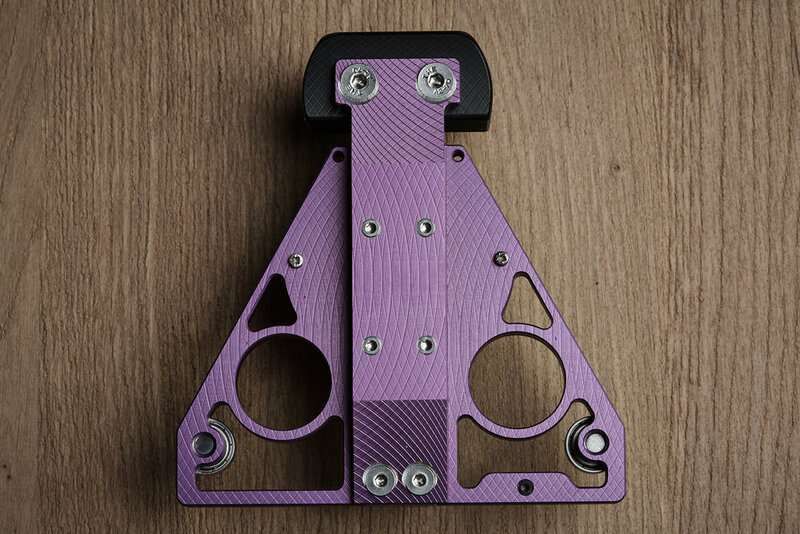 It's anodised in a purple finish that shows off the fine detail wonderfully. The body corresponds perfectly to the shape of the Swiss made Atorn dial indicator. In an effort to reduce any friction when a reading is taken, Filip decided to incorporate a THK linear roller bearing. This linear bearing is an ultra precise piece comprised of over 50 distinct internal parts, and this is what separates our meter from any other meter in existence. It not only alleviates unwanted friction but helps to enhance the accuracy of the dial indicator. Underneath that 6082 alloy enclosure is the THK linear bearing. It incorporates 50 precision pieces to enable an almost completely friction free action. No other spoke tension meter made today utilises this unique design feature. One other important addition was that of sealed bearings in the spoke path. I feel this feature helps in quickly placing the meter on a spoke and also works when zeroing out the meter when you are ready to take a measurement. The meter glides along the spoke effortlessly. To my knowledge, there are only a few other spoke tension meters that have incorporated this idea. After testing a few different springs Filip decided that a local custom spring maker could provide us with the exact spring we needed which is made from carbon steel. All the small details like this add up to a superior functioning meter. The 6082 anodised alloy body achieves an ideal weight for this tool. 696 ZZ bearings facilitate easy movement in the spoke path, and the Atorn dial indicator provides perfect accuracy with each tension measurement. The ultimate spoke tension meter for those who insist upon the best. Our meters design owes a debt to Jobst Brandt, author of "The Bicycle Wheel", who originally produced a spoke tension meter with this triangular shape. Several other companies have also exploited this design. It sits very nicely in your hand and is quite light weight which is especially important for any tool that might be used by a wheel builder for a better part of the day. I would be remiss if I didn't remark on the ultra high quality dial indicator that we have chosen. It could have been tempting to opt for a cheaper dial indicator, but our goals were centered around producing the finest meter possible so naturally we decided upon using an ultra high quality dial indicator. A single reading is all that is necessary to know that you have arrived at an accurate tension evaluation. 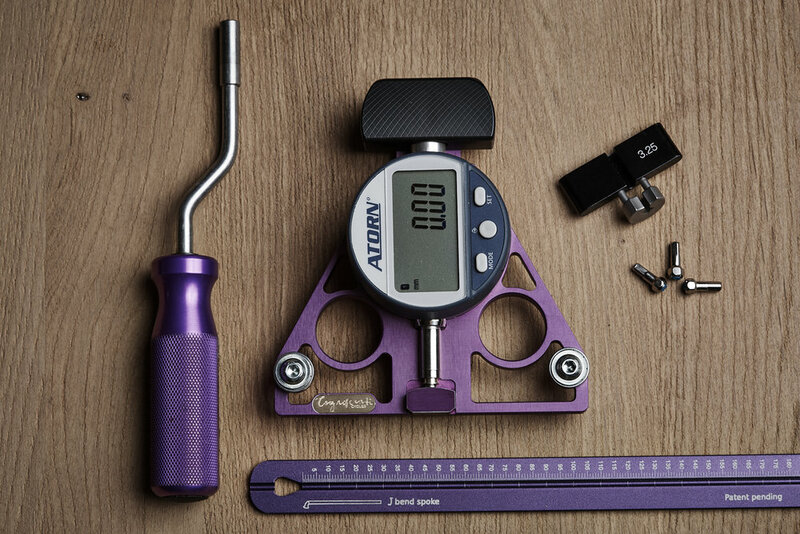 With each meter we will include a small handy chart that provides the tension values for various spoke dimensions. Those numbers will give you corresponding information about the actual KGF (kilograms of force) of spoke tension. If one prefers to work in Newton Meters, simple online conversion tables will make that calculation for you. Our meter is put together with fine quality stainless steel screws and even our plunger handle is hand made. In the end we feel quite confident that we have not overlooked any detail in building the finest spoke tension meter available today. Not only does it hold its own against the competition, we feel that it stands alone as the first choice for those who insist on the highest quality tool available. If you are a serious wheel builder who thinks this should be part of your work flow, then please contact me for any additional information. Our meters are hand made one at a time for each individual customer. All current Cognoscenti Cycles spoke tension meters will proudly bare the name of our company with an engraved brass plaque.